Do you know if there is a way to get to know the data passing through the interaction port? It may make more sense to do your own interaction plugin from scratch... I've done that, it doesn't need cabling, and it's fairly slick, but it only works with my own renderer patches. However, it will keep working in RII which is also handy. Here's a trick - hook up interaction to something that's interaction enabled, like a sprite. 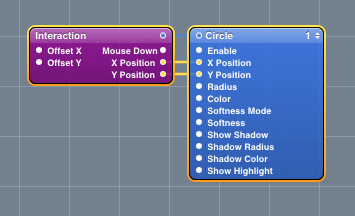 Hook the x/y outs to the object that is not interaction enabled. Place the sprite underneath your clear, so you won't see it. Now your non-interaction enabled renderer will move around when you grab it. That is a neat tip. Any tricks for saving interaction positions with a composition? the only trick that comes into my mind is to write and read a file... using kineme "file tool".